I have always been interested in scuba diving and in cave diving, but because of high rate of accidents I have become cautious. Because I was following all events in the field of diving that is why I have heard of Nuno Gomes earlier. His unbelievable performance of going as deep as 283 m into the Bushmansgat cave in South Africa could not have gone unnoticed. Nuno Gomes is considered as number 1 diver in the world.I did not hesitate when there emerged an opportunity to perform a few series of dives with this man. Witold Smilowski also joined us in this expedition. At that time, I had already 20 years of experience in scuba diving, a few years of experience in commercial diving, and Instructor’s Training Certificate, CMAS and IANTD with more than 1000 dives. I thought I was an experience diver however it appeared to be only my illusion. I performed my training with Nuno in Wondergat and Bushmansgat in two sessions, two weeks in November 2002 and about two weeks two months later. We performed 5 dives below 100 m, including 114 m, 123 m, 157 m, and I have to admit that my opinion about technical diving has totally changed. First of all I realized, that all of the technical diving schools teach safe diving only up to the depth of 70-80 m. So in the case of deeper dives most of the rules should be accordingly adjusted. Thanks to Nuno Gomes I understand that deep diving is a process consisting of combination of factors: logistics, training, and cost. After full mastering of those factors one can minimise the risk. We usually focus on the training and personal equipment but this, unfortunately, is not enough. Logistics is very important as well. 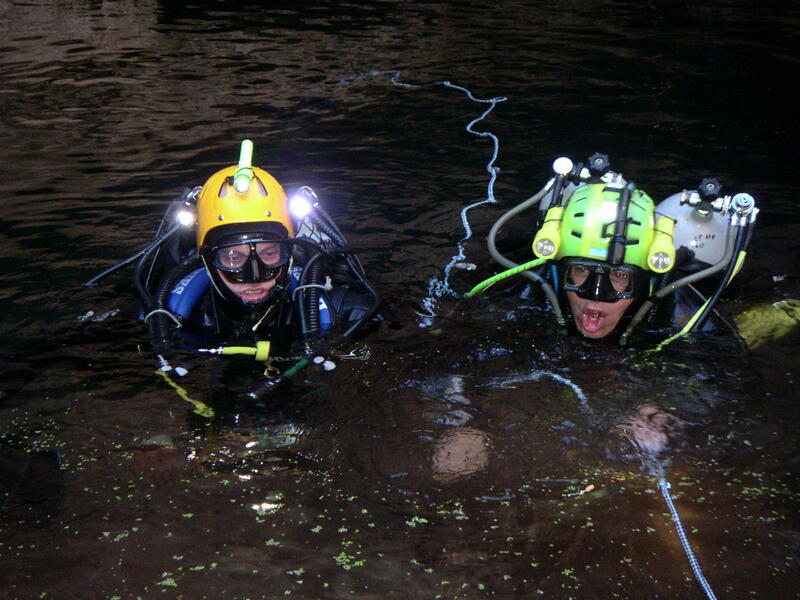 The approach to deep diving has to be similar as to climbing expedition. That is great logistic enterprise. The big group of people has to be organized, tasks must be delegated. The leaders, divers, back-up, mechanics have to be appointed. It is hard to control the risk without careful planning and precise scheduling of the whole day, division of roles, and strict discipline. On the other hand it is essential not to miss the pleasure of diving, and great atmosphere of adventure and friendship. One of the most distinguishable features of character that Nuno Gomes possesses is the ability to create friendly atmosphere managing at the same time. Costs are tightly bound to logistics. I have become aware that difficult diving and deep diving cannot be performed at low cost. Having observed Nuno’s actions together with Witold Smilowski, we described it as “zero tolerance, zero compromise” that means there must be enough good quality equipment, enough gas, back-up staff, and no time pressure whatsoever. What is interesting he applies the rule “zero tolerance, zero compromise “ together with the rule of maximal simplicity. It reminds the rule KISS: only necessary equipment (but the best quality), simple and elegant decompression (but very conservative). A small number of mixed gases taken under water (i.e. for 157 m; AIR, TMX7/66, TMX 10/50, EAN 50, Oxygen), but very precise process of mixing and selection of gases are also needed. Nuno Gomes has announced the trial of beating the world record in deep diving in 2003. He will try to go down as deep as 320m in Red Sea. I feel honored, because I have been invited to his back-up team. Will he succeed? We all wish him the best. I am sure that he can reach his goal, even though this will be amazing and extreme achievement.